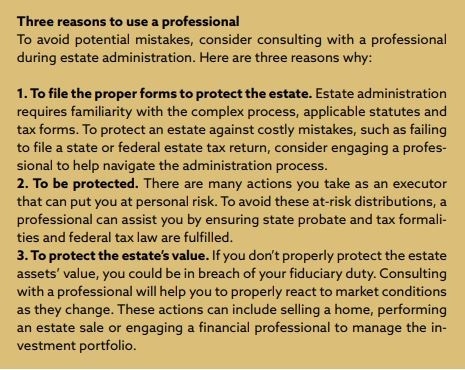 All too often, executors without quality legal guidance make mistakes during the process of carrying out these responsibilities—mistakes that expose the estate to litigation, increased tax liability and other potentially serious consequences. As executor, you are liable for the estate and its distributions. If you make distributions from the estate—handing out money to family members, for example—before taxes and other liabilities are paid, you are personally responsible. The same is true if you make disproportionate payments to family members. Such distributions, known as “at risk” distributions, should be avoided. That’s not to say you can’t make these distributions. But a miscalculation or unexpected claim puts you at risk—if, say, you need to get money back from a family member to pay a tax bill but that person has already spent it all. The concept of portability means a surviving spouse can make use of both his or her individual federal estate tax exemption and the unused exemption of the first-to-die spouse. Because every decedent is allowed a federal exemption of $11.2 million in 2018, this allows a married couple to shelter a combined $22.4 million from any federal estate tax liability. However, this estate tax exemption can often cause a problem for surviving spouses when the entire estate of the first-to-die spouse is sheltered from estate tax. This key requirement is commonly overlooked because you have to ask for it. Even if no estate tax is due upon the death of a first-to-die spouse, the executor of the estate must elect portability by filing an estate tax return on Form 706 within 15 months of the death, with the filing of a proper extension. And if you don’t use it, you lose it. The appointment of an executor and the existence of the estate may need to be advertised in a local newspaper. If there are debts owed, creditors need to be notified so they can make claims against the estate if necessary. Each state has different laws that govern the advertisement of an estate. Failure to satisfy a notice requirement may expose you personally to the estate’s creditors. As executor, you would be responsible for managing the estate’s assets—including any stock portfolio. While you don’t necessarily need to have the financial and business acumen of Warren Buffett, failing to monitor the markets and estate investments could seriously damage the estate’s value. As an executor, you’re also a fiduciary—someone who is legally required to act in the best interests of the heirs or other beneficiaries of the deceased person and to follow the instructions the deceased person spelled out for you. That means it falls on your shoulders to ensure the estate’s financial health. That job may involve buying and selling stocks or other securities in response to bull and bear markets. Executors who have properly distributed most of the estate’s assets often fail to properly close the estate. This may involve filing a family settlement agreement with the court showing that all beneficiaries agree that they received their share of the estate or going through a court accounting process where a judge ultimately approves of the distributions. It is also recommended to work with an accountant (or an estate administration lawyer in more complicated cases) to ensure all tax matters are concluded before the estate is finished with administration. The SFA does not give tax or legal advice. This information is not intended to be a subtitute for personalized professional tax or legal advice. Please consult a qualified tax or legal professional.